In contrast, the workspace is the modern equal of a workstation. A user can enter the workspace while traveling, working from home, or in a flexible workplace without permanent desk assignments. One day you could be sitting at your office (workspace 1), then next you might be in the meeting room (workspace 2) all day going over sales and operations planning. Then while you’re on the road, you would go to a flexi desk or coworking space (workspace 3) in a business hub to get some last-minute work out of the way before you travel back to the home city. By enhancing and improving the workspace, organizations can affect change at the core of where work happens. That versatility allows you to embed organizational culture traits like mobility and flexibility. As an employer or employee, keeping abreast with change is paramount. As work becomes more flexible and communication are more mobile, the office is turning into an increasingly intricate and even intangible concept. Thinking about the future, we have to ask: Will the workplace be on-site at our employer’s property, or on-demand at a collaborative space? Flexible workspace offers users benefits like: open, collaborative co-working spaces, complete with on-site amenities and frequent networking opportunities to inspire collaboration, innovation and creativity. Conventional workspace users would tend to have like-minded people, team spirit, however all working under a single umbrella and for one organisation, so yes there will be brainstorming sessions and team events but no benefits like networking or the ability to work flexibly. The ability to work in a flexible workspace is based mainly on the job role you have, not a personal preference, as there are some jobs till date which need to be worked on-site and have to be done in a similar manner. Higher employee productivity as being critical and tangible business benefits associated with flexible workspace. 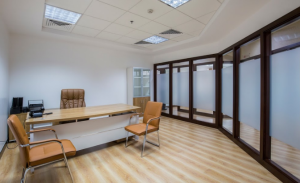 Looking for Office Space in Dubai? 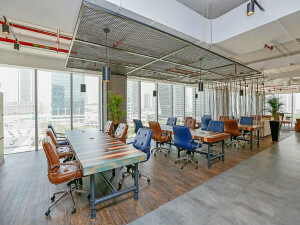 If you are looking for a workspace in Dubai, we have all of them. Quiet or Full of noise, Views or without views, Big or Small, Amenities or not, with your daily fuel of unlimited coffee, water, tea. All you need to do is go online and start browsing through the hundreds of options available on fluidmeet. You can request a call-back directly from the venue host for monthly workspace use, or you can book directly online for a space for a few hours or a day.